I started Muay Thai in 2003 after giving up smoking in the pursuit of a healthier “habit” and quickly became hooked! I trained at KO Gym under coaches Bill Judd and Vinny Jones. Paul Marut and David Pacquette also played a big role in my coaching. I had some great training partners and several women at the same weight and level as me. It took me two years to think I was good enough to participate in an interclub, but after that my confidence grew and I quickly rose in the rankings. My first pro-fight came in 2006, then I fought up and down the country in order to find a woman my weight. 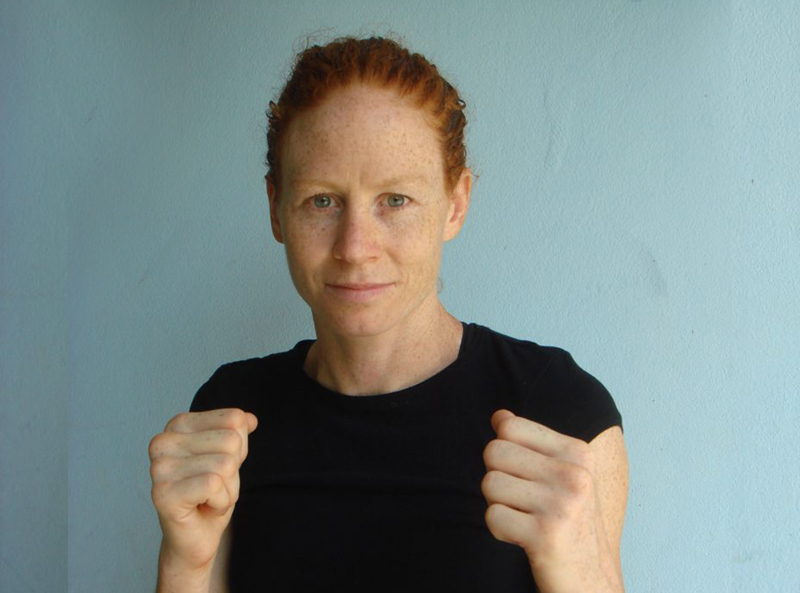 By 2008 after beating Sheeree Halliday, I became the No.1 female fighter in the UK at 57kg. Simultaneously, I fought amateur Muay Thai in the IFMA European and International games- European champion and no.2 in the world in 2009. I spent 2 months training at the Kiatphontip Gym in Bangkok in early 2010 and later that year won the WMC world title against Bernice Alldis. In 2011 I made the switch to Mixed Martial Arts (MMA) and began training jiu-jitsu and wrestling under coach James Duncalf. Training in a new martial art was a humbling experience after being top of my game in Muay Thai, but I valued the experience. I fought four times as a pro-MMA fighter and retired from fighting in 2014. I still continue my martial arts training, albeit less intensely than previously, along with weights training, yoga and climbing. I first started teaching Muay Thai classes and personal training in 2009, starting first at KO Gym in Bethnal Green and now at Bloodline in Clapton. Since then I have enjoyed giving back and sharing my skills and experience in the sport. Participation in martial arts for me is more than just fighting and getting fit, its about how it carries over into the rest of your life – it can help overcome fears and challenges and build discipline and determination. The focus of my classes is holistic; you will work hard, but I’m technical so prepare to be corrected! Stamina, strength and flexibility are key components of my classes. I also aim to create an atmosphere of cooperation where students help each other to improve and they can learn to think for themselves. Anna is teaching General classes every Monday 8pm and Wednesday 11am. Anna is also available for PT classes please contact Bloodline Gym for more details.